Well done to Steve and Adam for trapping and posting. I did n`t trap on Friday, due to the wind, but did so last night. A fair mix of moths in my garden traps, but disappointing numbers-wise. 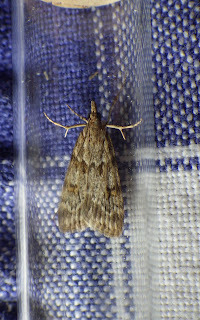 A diamond-back moth represented the migrants - do look out for this small micro, as it`s easy to identify. Mine would n`t stay still for a decent photograph and when I placed it to take another (after a period in the fridge), it `spiraled off` skywards. Above: Scoparia ambigualis. Incidentally, there is a VERY GOOD i/d article for these `grey pyralids` by Jon Baker in the Carms Moth Group Newsletter No 9 - see `Newsletter Archive` link on the top right-hand side of the blog page. Highly useful and recommended. It doesn't look nearly bright enough for S pyralella to me, I'm afraid - I'd have called that S ambigualis. Sam - believe it or not - I was about to change it to ambigualis myself, after further reading up etc! If I`d been 20 mins earlier, I`d have beaten you to it! I`ll change the caption above though. there are a number of tactics to lessen cholesterol levels. You are going to be able to get rid of toxins in your body so you will feel healthier. There are a number of excellent treatments for anxiety. The truth is that lots of people have had problems with family and friends or lost jobs while struggling to manage panic disorder. It is an impossible task to proceed, if you keep stuck in blame and anger. Make your luck smile, go to the website of the online casino BGAOC and win without a hitch online gambling for you Take the winnings constantly and without restrictions.